​We have lots of great upcoming events to tell you about! 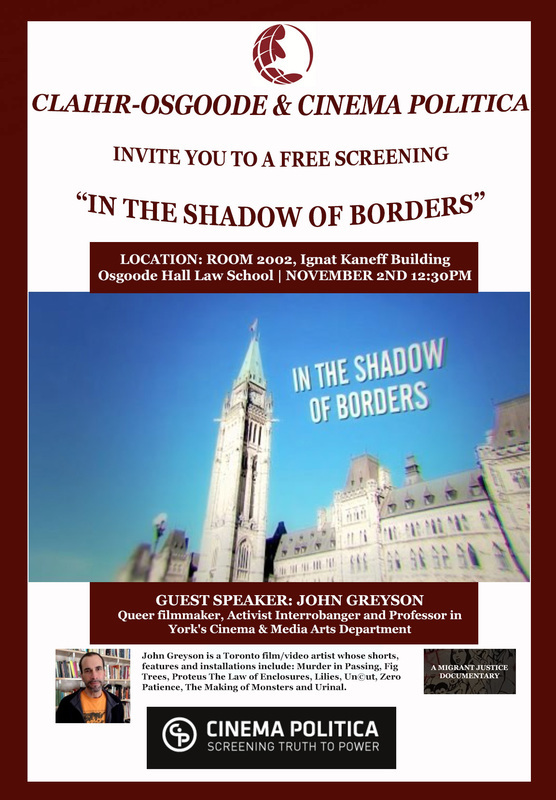 Film screening, “In the Shadow of Borders”, with an introductory talk by filmmaker and activist John Greyson! Hosted by: CLAIHR-Osgoode and Cinema Politica. John Greyson is a queer filmmaker, activist Interrobanger and professor in York's cinema and media arts department. His works include Murder in Passing, Fig Trees, Covered, Lilies, Zero Patience. Professor Greyson will show a short film, "Bulldozers" about "a musical showdown between Censors and BDS supporters" and will talk about censorship and free speech issues. In the Shadow of Borders, Migrant Justice Documentary. “Is Canada the welcoming country for migrants it likes to call itself? In the Shadow of Borders challenges this myth and, through personal stories of detention, denial of essential services, labour exploitation and deportation, exposes how precarious are the lives of those without status. By connecting histories – of indigenous sovereignty, of Canada’s role in displacement, of its discriminatory policies – this documentary portrays grassroots resistance to xenophobic governmental practices and the struggle of migrants for freedom of movement.” Watch the trailer. Come watch, listen, learn, and discuss. Samosas with also be available. Please join CLAIHR and the OBA Foundation for this free event! Canadian Responses to the Syrian Refugee Crisis: Reflections on the First Year, a panel discussion and reception. Osgoode's Black Law Students Association Event: Taking Your JD to International Heights. Are you interested in practicing overseas? Looking for information on how to carve out your own opportunities? Join us for an informal chat with Osgoode alum Tiffany Smith (Class of 2015), who will share about her journey as an aspiring human rights lawyer. Some background on Tiffany: In the summer after 1L, Tiffany participated in the ILP Fellowship Program, where she worked at the Foundation for Human Rights Initiative in Kampala, Uganda. She fell in love with the country, the culture and the people, and happily returned to Kampala the following summer to work at the Centre for Public Interest Law (CEPIL) with the help of the Ian Scott Public Interest Fellowship. This past year, Tiffany was accepted into the Canadian Bar Association Young Lawyers International Program and participated in a 6-month internship at the Katiba Institute in Kenya. And in a few days, Tiffany will be jetting off to Uganda once again to work at Engineers without Borders. We are grateful to have such a great resource make some time in her busy schedule to come and speak with us, and provide us some insight on pursuing a non-traditional legal career. Our next meeting is this Wednesday, October 26th at 12:30pm in the Nathanson Center (Room 3067) of the main Osgoode building. All are welcome to attend! As always, if you have any questions, ideas, or want to get involved, get in touch with us! The following events are not organized by CLAIHR-Osgoode. For further information on these events, please see the contact details provided in the posters/listings.